International industrials and metals group, Liberty House, has confirmed that it had signed a provisional agreement with Tata Steel UK to acquire Britain’s largest steel pipe mills, based at Hartlepool. Liberty will now conclude discussions with a range of stakeholders on a support package that will help facilitate the rescue of the remaining 140 jobs at the mills and the recruitment of more staff. It is anticipated that a support package will help Liberty to stabilise and grow the business through upskilling the workforce and developing new products. The 42-inch and 84-inch longitudinal submerged arc welded (LSAW) pipe mills at Hartlepool make heavy-duty steel pipe for the energy, power and construction industries in the UK and worldwide. Today’s announcement follows closely behind Liberty’s acquisition from Tata Steel of the Speciality Steels business employing more than 1,700 people in Yorkshire, Lancashire and the West Midlands, and its purchase from the administrators of Caparo Industries of the country’s largest Merchant Bar mills based at Scunthorpe, preserving another 145 jobs. It also comes only days after the announcement of a deal for the GFG Alliance, of which Liberty is part, to acquire Australia’s flagship integrated steel producer, the Arrium Group, including mining, metal recycling, steel making and a variety of steel mills, employing a total of over 5,500 people. The addition of the Hartlepool pipe mills would bring Liberty’s UK workforce to nearly 5,000 people spread across more than 30 sites, making it one of Britain’s largest industrial employers. The acquisition would also spell good news for Liberty’s plate mills in Scotland as its Dalzell and Clydebridge plants would be able to supply steel plate to the Hartlepool pipe mills. Liberty also intends to upgrade its steel making in Australia and the plate mill at Dalzell to be able to make high-grade API plate capable of being rolled into large diameter LSAW pipes at Hartlepool for oil and gas pipelines globally to the highest specification. The 42-inch and 84-inch LSAW mills being acquired by Liberty have a combined production capacity of over 250,000-tonnes a year. 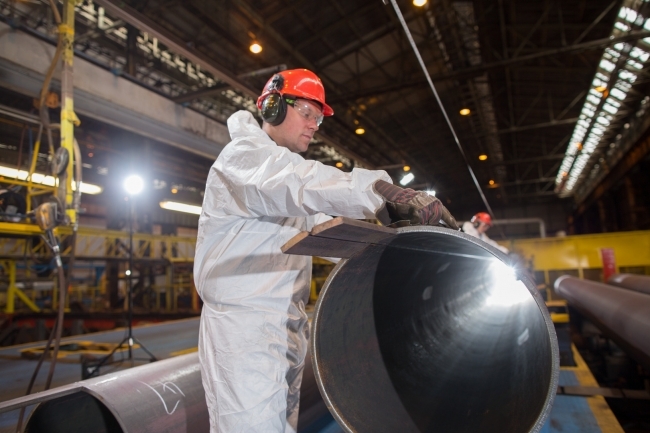 Under the planned agreement, the neighbouring 20-inch mill, which makes high frequency induction (HFI) pipe, would remain in the ownership of Tata Steel UK as it is linked to the company’s strip products business centred on steelmaking in Port Talbot.